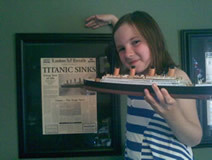 Left is Erin with a model of Titanic that she and Dillon made with a little help from me. 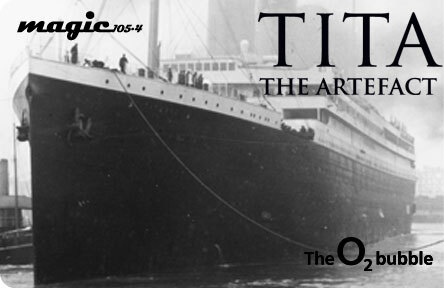 On 25 June 2011, we drove down to London, well Edgeware Tube Station, and then by underground to the O2 Arena to see the Titanic exhibition as Dillion is mad about anything to do with that ship. 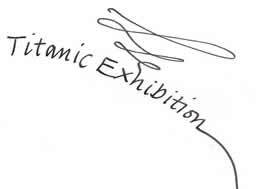 When we entered the exhibition, we were all given a boarding card similar to the real one issued on that fatal trip. Each card had the details of one of the passengers that boarded Titanic and when we came to the end of the exhibition there was a plaque with all the names of those who survived and those who perished. It was very poignant. We all touched a small piece of Titanic's hull that was rescued from the deep and saw lots of other artifacts and possessions once owned by those who died on that fatal night in 1912. There was also a real ice-berg as hard as steel and very cold. We saw a mock-up boiler room which was massive and must have been an incredibly hot place to work. You could buy an actual piece of coal brought up from the deep but at £30.00, for the size of a small marble, it was too expensive. 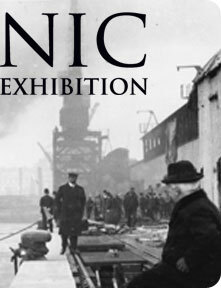 Titanic consumed coal at a rate of 1.2 kg for each metre travelled (England to America is about 5,568,990 metres)!